Desktop digital video editing software (such as Adobe Premiere Pro, Windows Movie Maker, iMovie, or GoPro Studio). There are also mobile video editing apps, such as Videolicious, Da Vinci Resolve Lite and Adobe Premiere Clip. Some loaner laptops and/or recording devices may be available upon request and/or you can use your own computer to complete the various multimedia storytelling assignments. Gray Wolf Hall 109 has four computer production workstations that can be reserved to complete multimedia projects for this class. These computers are equipped with fully-licensed Adobe Creative Cloud software, which includes Adobe Photoshop (image editing), Adobe Premiere (video editing) and Adobe Audition (audio editing). Please note that you may need to request access to (and in some cases reserve in advance) these computers from the front desk in Gray Wolf Hall. Gray Wolf Hall 162 serves as both a classroom space and computer lab. This room will be open for student use during some non-teaching hours. Please look for signage on the entry to the room for posted lab hours this semester. This course is designed to enhance existing journalism skills and to apply reporting techniques across multiple media platforms. While this class is not meant to be a substitute for dedicated Web design and content development courses, it is expected that students utilize and expand upon the skills introduced in both COM 300 (Writing in Communication) and COM 210 (Multimedia Content Creation). Thus, students will be generating original news journalism and feature story content across multiple types of media, including traditional print, web, online-distributed audio and video and photo slideshow formats. Pending time and availability, this class may also venture into content creation using more experimental platforms. At the conclusion of this course, each student should have increased his or her knowledge of online content development and storytelling techniques through various tools and techniques. My teaching mission is to share and propagate the journalistic standards and ethics held by this school’s namesake – Edward R. Murrow. It is my goal to help instill a set of core values, ethics and skills that will help to immunize journalists against the inevitable temptations present in this industry. In journalism, credibility is earned. One poor choice can destroy an entire career. For this reason, you will need to operate at the highest standards of truth, fairness, balance and accuracy. Demonstrate an ability to write critically on issues related to local, regional, national and world events. Demonstrate an ability to conduct research on a topic of their choice, conduct interviews and present their findings in professional journalistic style. Develop a better understanding of how U.S.legal and constitutional protections protect freedom of speech, expression and the press. Demonstrate an ability to report on and be sensitive to issues from different cultures and global perspectives. Academic integrity is the cornerstone of higher education. As such, all members of the university community share responsibility for maintaining and promoting the principles of integrity in all activities, including academic integrity and honest scholarship. Academic integrity will be strongly enforced in this course. 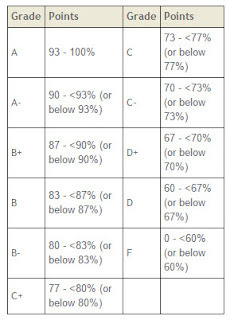 Students who violate WSU’s Academic Integrity Policy (identified in Washington Administrative Code (WAC) 504-26-010(3) and -404) will (i) receive an academic penalty ranging from a minimum of both a zero on that assignment and the reduction of a full letter grade on your final grade to failure of the entire course, (ii) will not have the option to withdraw from the course pending an appeal, and (iii) will be reported to the Office of Student Conduct. Reasonable accommodations are available in classes for students with a documented disability. If you have a disability and need accommodations to fully participate in this class, please either email or call the Access Center (access.center@wsu.edu; 509-335-3417) to schedule an appointment with an Access Advisor. New students to the Access Center are asked to visit the Access Center website to complete an application: http://www.accesscenter.wsu.edu. All accommodations MUST be approved through the Access Center. Once accommodations are approved, students are expected to meet with course instructors within two weeks to discuss implementation. Please sign up for emergency alerts on your account at MyWSU. For more information on this subject, campus safety, and related topics, please view the FBI’s Run, Hide, Fight video and visit the WSU safety portal . For Everett-specific emergency information (including severe weather alerts), please visit https://www.everettcc.edu/emergency/. Absolutely NO communication will be sent to external addresses (e.g., yahoo, gmail, and so forth). We will use either the email within Blackboard or “email.wsu.edu” system. Late work is not accepted in this class. Tests and quizzes missed due to absence cannot be made up. Do not ask for after-the-fact exceptions. Some consideration, however, might be given (at the discretion of the instructor) if there is extenuating circumstances such as prolonged hospitalization, family death, or extended individual sickness previously discussed. In cases of documented university conflict, you are responsible for making alternative arrangements a minimum of two weeks in advance and responsibilities must be fulfilled before the normally scheduled time. In order to ensure participation from all students, credit is given to those with strong attendance and promptness. Excessive absences will result in a lower grade for the overall course. Specifically, more than TWO will adversely affect your final grade due to reduced credit for attendance and participation. Class attendance is vital, as material will be introduced that is not covered in the text. Poor attendance will be reflected in your grade because of missed assignments or problems with completion. Assignments missed due to absence generally can't be made up. Do not ask unless there are exceptional circumstances for an excused absence. Consideration might be given if there is documented hospitalization, family death, university-sponsored travel (documented in advance) or extended individual sickness. I will generally respond to emails within 24 hours during the week. My expectation is the same for students. You need also to check your email regularly and respond within 24 hours. I generally do not respond to emails during the weekend. Nor is it expected that you will respond over the weekend. I generally do not discuss grades or any student records issues via email. Please schedule a meeting with me to discuss these issues. If necessary, I may ask you to submit a written petition together with your work in question. The classroom is typically not an appropriate place for these discussions. Throughout the semester, you will be working on writing and multimedia assignments designed to show off your reporting and online content development skills. You will maintain an online website/blog for publishing your work that will be accessible by the instructor and classmates. Please be aware that any information posted on this site will be publicly viewable and, thus, may be held to many of the same legal and ethical standards as writings published in traditional media. Please be prepared to share and discuss your work in class. Please not that we do NOT plan to have a final in this class, so the completion of all assigned writings and/or multimedia projects in your portfolio accounts for a large percentage of your grade. Any missed assignments will impact your final grade in the class. 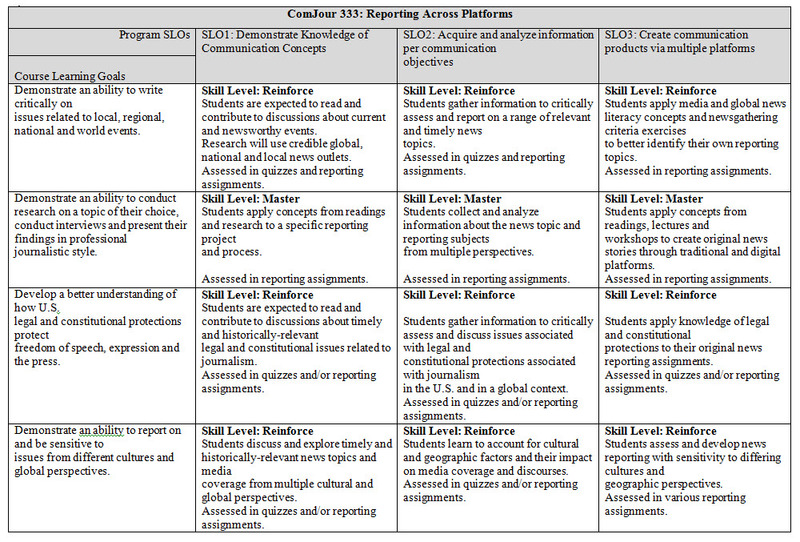 Projects and/or reporting assignments will be graded on a rigorous and fair system. Even though much of your work will be published on the Web, your content creations will still be evaluated according to traditional media reporting standards, including quality of the lead, use of language, economy of expression, readability, organization of material and content. In evaluating mechanics, I will consider and review spelling, grammar, punctuation, syntax and Associated Press style. Do not misspell words or names. Errors can (and will) dramatically reduce your grade on that assignment (possibly less than passing). 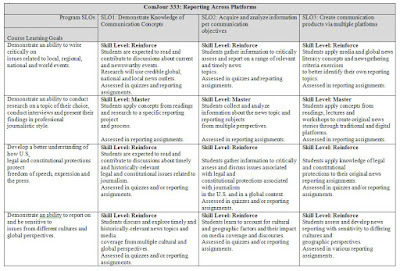 In evaluating story reporting, consideration will also include news judgment in gathering and selecting information, accuracy, story approach and fairness. A, A - = The copy or production is EXCEPTIONALLY well-written or produced, thorough and is FREE OF ERRORS in style and grammar. The lead is clear and concise. The copy is well-organized and contains effective transitions, quotations and descriptions. The copy is ready for publication or broadcast. B+, B, B- = The copy or production is WELL-WRITTEN or produced but may contain MINOR ERRORS in style and grammar. The lead is solid and summarizes the copy. Most of the information is presented clearly and according to proper writing style. It requires minimal editing for publication or broadcast. C+, C, C- = The copy or production is POORLY WRITTEN or produced and shows a lack of organization. The copy may have a rambling, vague lead and a poorly-constructed, awkward body. There may be an excess of style and grammar errors. The copy requires a good deal of editing. D+, D = The copy or production shows very little organization or purpose. It contains many of the necessary facts, but they are so ineffectively presented that a major rewriting effort is needed to make the copy cohesive and meaningful. The copy has TOO MANY STYLE AND GRAMMAR ERRORS. It can be published or aired only after extensive editing and rewriting. F = The copy or production is LIBELOUS, INCOMPLETE, CONFUSING OR HAS FACTUAL ERRORS. Style and grammar errors are found throughout. Correct writing is either missing or lost completely. It cannot be published or aired. Does the lead (in writing or in your production) tell what the story is about? Is it creative, interesting and relevant? Is the story well reported? Does it have multiple sources? Is it balanced and objective? Are all of the reader or viewer questions answered? Are direct quotes informative and of high quality? Are all sides of a story represented with a diversity of voices? Is material organized in a logical fashion? Is the writing or production clear and concise? Since there will be an online component to some of the work you submit, I will also factor in the technical execution of your storytelling. University policy (Academic Regulation #90) states that Incompletes may only be awarded if: "the student is unable to complete their work on time due to circumstances beyond their control." Thus, incompletes will NOT be given except in cases of documented emergencies, and the student must be passing the course at the time the Incomplete is requested. The Incomplete will be assigned ONLY for those circumstances (sickness, accident, death) that meet the literal interpretation of Academic Rule, 90h. Sickness, accident or death must be documented. You should not plan on extra credit. I will discuss extra credit opportunities in class if they become available. Your participation in any extra credit assignment is voluntary. We are tentatively planning at least one class test - a written response exam near the end of the semester. This test may require that you reference the specifics of online publishing and/or technical skills learned in class, so it will be important that you understand how to work with each multimedia technology prior to the end of the semester. In addition, there is the possibility for unannounced in-class quizzes or assignments that require attendance in order to complete. For students enrolled in undergraduate courses, midterm grades will be submitted by 5:00 p.m. on the Wednesday of the eighth week of fall and spring semesters. 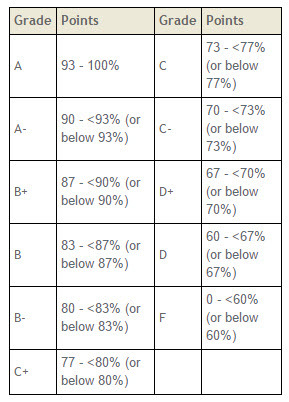 A C midterm grade is given to any student who is making satisfactory progress. An F midterm grade is given to any student whose progress is not acceptable and who needs to discuss his/her progress with the instructor. The assessment should not be interpreted as a formal grade, but rather as an indication of the student’s progress to date. Midterm grades are advisory and do not appear on the student’s permanent record, the WSU transcript. Students are encouraged to refer to the academic calendar often to be aware of critical deadlines throughout the semester. The academic calendar can be found at http://registrar.wsu.edu/academic-calendar/.